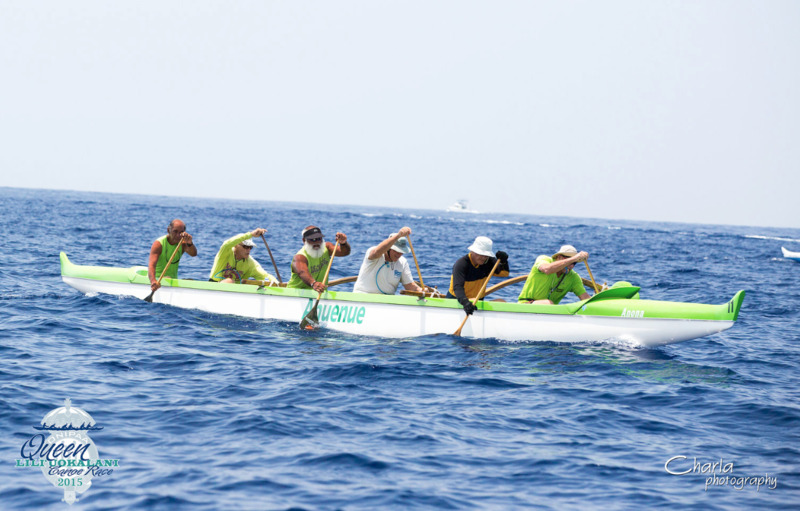 Queen Liliuokalani Races 2015: Kona was a little damp this year to say the least with near-monsoon rains drenching the area on late Friday afternoon but on race day Saturday it was pretty typical weather with little or no wind and humid conditions. We had two iron crews in both mens and womens OC6 races, and one (a special group calling themselves the Ladies in Red in support of a friend) took third place on their division. The Novice crew had a good race finishing in the middle of the pack, and the 65s hung in there finishing 4th out of 7. On Sunday, the 65 men were bronze medalists in the 6-mile double hull race and Steven and birthday boy Daniel jumped in with a mixed crew and just got edged out for a medal as well. The ladies paddled first and were all smiles as they enjoyed the shorter course event. Ānuenue may have recorded a first as we managed to successfully take out the double hull rig from the end of the pier instead of hauling the canoes up the ramp as usual. Special props to the ladies who were right there to support the menʻs crews on Saturday and even organized a Happy Birthday chorus with some onlookers as Daniel passed by after their finish!